The day following the conclusion of the 2015 regular season, the Rams, Oakland Raiders, and San Diego Chargers all filed to relocate to Los Angeles. The same day, the NFL announced that any franchise approved for relocation would need to pay a $550 million relocation fee. 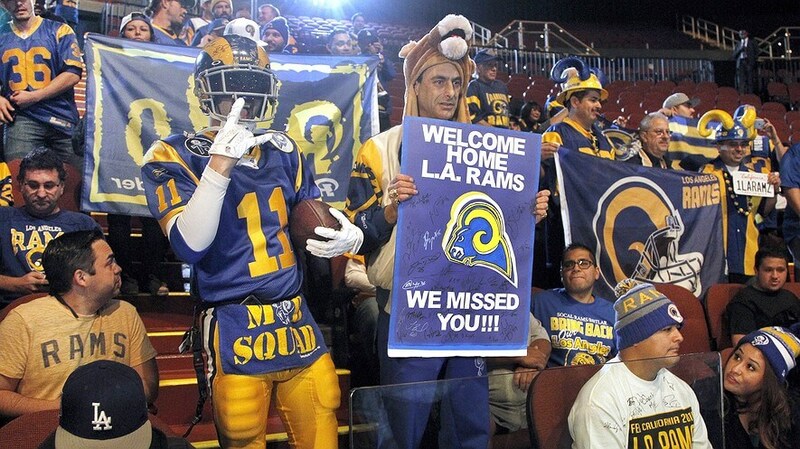 On January 12, 2016, the NFL owners voted 30–2 to allow the Rams to return to Los Angeles. The Rams are the second NFL franchise to return to a city they had previously played in. The first NFL franchise to relocate to a previous city was the Raiders, who had left Los Angeles, along with the Rams, in 1995; the Raiders relocated back to the Coliseum in Oakland, California. The Rams are the first major league sports team to relocate since 2011, when the Atlanta Thrashers left Atlanta and became the Winnipeg Jets, which, similar to St. Louis, was the second time Atlanta lost a sports team in that league (NHL). The Rams held a press conference at The Forum in Inglewood on January 15, 2016, to officially announce its return to Los Angeles to start play in the 2016 season. The Los Angeles Memorial Coliseum will be the temporary home stadium of the Rams until City of Champions Stadium is finished for the 2019 season.